The Cuilcagh Way is a waymarked 21-mile route in southern Fermanagh. It follows the course of the river Cladagh through a steep limestone gorge, past the Marble Arch Caves, crosses a series of wooden boardwalks leading across steep terrain and boulder fields to reach the blanket bog summit of Cuilcagh Mountain (666m). The summit plateau of Cuilcagh Mountain marks the border between County Fermanagh and County Cavan (in the Republic of Ireland) and is the highest point in both counties. After leaving the boggy flanks of Cuilcagh Mountain a spur path crosses the dry valley known as the Legacurragh Gap, an area of limestone rich in fossils, to reach the viewpoint at Gortalughany and returns the same way. Continuing over moorland, the route cuts between the slopes of Benaughlin Mountain and Trien hill crossing a patchwork of fields and bracken. A section of woodland follows in which lies the 18th century Florence Court House and Gardens. A final section of open farmland, giving fine views of Gortmaconnell Rock, leads to a country road back to Marble Arch Caves Visitor Centre. The outward route is retraced to Cladagh Bridge. The Cuilcagh Way lies within the Marble Arch Caves Global Geopark. Dogs are not allowed on this route. The downloadable walker's guide describes the route in five stages: the Cladagh Glen Walk, the Cuilcagh Legnagbrocky Trail, the Cuilcagh Hiker’s Trail, the Legacurragh Valley Trail and the Florence Court Forest Trail. 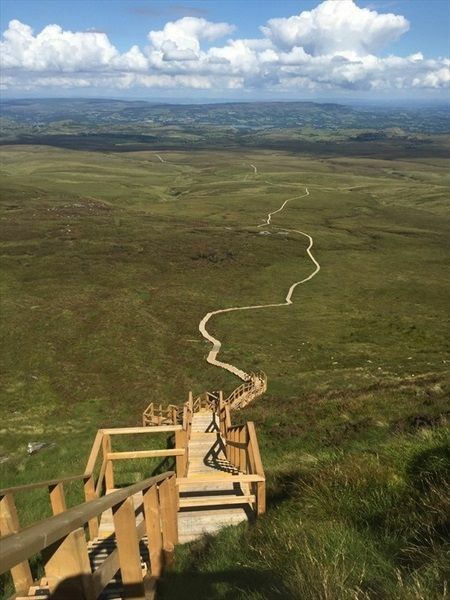 The Cuilcagh Way is one of ten Waymarked Ways, a series of accredited walking routes that pass through some of the most beautiful scenery in the country ranging in length from 20 to 47 miles. These walking routes with waymarked posts have excellent infrastructure in place. Interpretation panels throughout the walks provide interesting information on local history, natural features and wildlife. The Waymarked Ways are: Antrim Hills Way, Causeway Coast Way, Cuilcagh Way, Lecale Way, Mourne Way, Moyle Way, Newcastle Way, Newry Canal Way, Ring of Gullion Way and Sliabh Beagh Way. All apart from this route were featured in the LDWA Trailwalker's Handbook.